Did you ever notice how quickly the weekend passes and before you know it Monday has once again arrived? Chances are your laundry room fills up just as quickly as your weekend passes, and you find yourself having to dedicate two or more days a week to doing laundry. Everyone would probably agree that doing laundry is one of their least favorite chores, but indeed a chore that absolutely has to be done. Though we all have washing machines and dryers, time still needs to be spent changing clothes from washer to dryer, sorting and folding the laundry and ensuring that the proper temperatures are selected during the wash and dry cycles. Let’s not forget the many garments that need ironing as well. With that said, what would benefit you most is our quality pickup and delivery services here at Jimmy’s Cleaners and Alterations. Utilizing our trusted services is every bit as easy as scheduling those Monday morning meetings. All you have to do is give a shout out to the friendly techs here at Jimmy’s Cleaners and one of our reliable drivers will be in route before you hang up the phone. You simply accumulate all your laundry and put it into one of our handy laundry bags, then leave it in a designated spot in your home that we have all agreed upon. Whether a porch, patio, or even the garage, simply leave your laundry where we can easily access it. There is no need for you to be at home so you can put your laundry out and head out to the office, to the country club, shopping or simply take the family pet out for a stroll in the park. Our driver will pick up the laundry and bring it back to one of our facilities here where our technicians will properly process and care for your clothes. Three days later we will deliver the finished goods back to your home and leave it in the same designated area where we picked it up. Again, there is no need to be at home. All payment arrangements will be made upfront when you choose to take advantage of our top of the line home laundry services. Truly, there is nothing easier and more convenient than our top-rated pickup and delivery services for all your family laundry needs. We offer attractive, affordable prices and timelines that are accommodating to the needs of all our clients. You can be sure our services will not cost you a fortune, because not only are our rates extremely competitive, but when you factor in the cost of your individual time, you will definitely be saving yourself a good deal of money throughout the year. And let’s not forget, though you will save yourself time and money, you are also alleviating one of the most tedious, boring chores that you and your family members no longer have to deal with. If you haven’t enough hours in the day and those weekend laundry blues are getting you down, then our award-winning pickup and delivery services are the ideal solution for you. The friendly professionals here at Jimmy’s Cleaners and Alterations are definitely the team for you. We look forward to serving all our valued clients and to providing you with state of the art, affordable laundry services that will simply not be matched by any of our competitors. Don’t let Mondays get you down with all that weekend laundry that has accumulated. Don’t delay. Give a shout out to our staff and schedule your laundry services today! 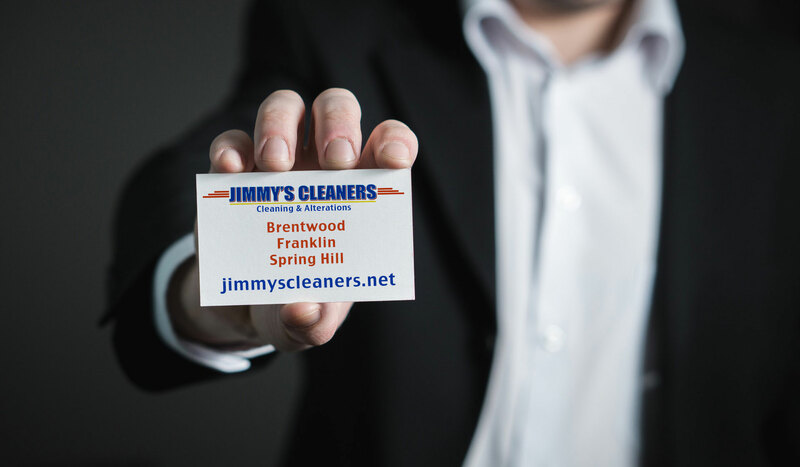 At Jimmy's Cleaners, we are focused on our customers. We understand that your time is valuable and sometimes a trip to the cleaners can be an inconvenience. That's why we offer courtesy Pick up and Delivery from your home or business! Pick up and delivery service is offered twice weekly. You will receive a personalized laundry bag. Also, take advantage of our convenient monthly billing. Corporate discounts available. If you're interested in getting started, fill out the form below or please call today: 615-599-3605.